If you can’t beat ‘em, join us. Every summer, millions of North Americans are miserable from mid-August to the first frost. One in five people suffers from ragweed hay fever, or allergic rhinitis. Far more than a nuisance, ragweed allergy can be a disabling condition. The cost of suffering from ragweed hay fever is measured in lost work time, the expenses of diagnosis and treatment and the misery that ragweed-allergy sufferers encounter every summer. The cause is a tiny ragweed pollen grain that’s invisible to the naked eye and carried freely by the wind. Just one ragweed plant can produce more than a billion grains in a season. Beginning in August, ragweed flowers release pollen grains to fertilize other ragweed plants. As we breathe, the pollen clings to the moist linings of our noses, eyes and lungs. In people with ragweed hay fever, the body senses pollen as a foreign invader and releases histamines and other chemicals. 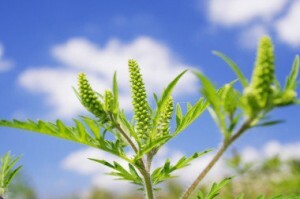 These defensive chemicals produce the well-known symptoms of ragweed allergy: red eyes and nose, runny and stuffed-up nose, puffy eyes, sneezing and itchy nose and throat. Although ragweed allergy occurs in young children and older adults, it is more common in adolescents and young adults. The Kingston area is prime ragweed-pollen country because of its fertile agricultural surroundings. Perhaps not surprisingly then, Kingston is home to a highly regarded medical facility that studies ways to help allergy sufferers cope. The Environmental Exposure Unit (EEU), located at Kingston General Hospital, is world renowned for its unique technology and research methods. The EEU’s researchers welcome volunteers who are allergic to ragweed to participate in their studies. DO close your windows at night to keep pollen outside, and use an air conditioner. DO stay indoors if you can, during peak pollen time: 5 a.m. to 10 a.m.
DO plan your outdoor activities for late afternoon or after a heavy rain, when pollen levels are lower. DO groom your pets to rid them of pollen when they come indoors. As for yourself, shower and change clothes after a prolonged period outside. DON’T plan a late-summer vacation in eastern Ontario’s fertile agricultural land, where pollen levels are high. A better choice would be a visit to the rocky Canadian Shield, where ragweed plants are less common. DON’T dry your laundry outdoors in allergy season, when pollen can collect easily on line-dried clothing and linens. DON’T suffer unnecessarily. Antihistamines, decongestants and steroid nose sprays can help alleviate your symptoms. Consult your doctor and, if suggested, see an allergy specialist.